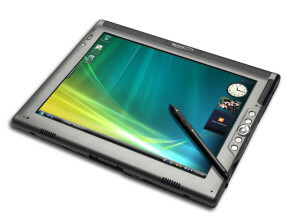 If you are looking for a light notebook sized Tablet PC with big RAM and the Vista Business operating system, the Motion Computing Model LE1700 may be prefect for you. Rated Four Stars (out of five). The Tablet PCs are quickly making their way into the mainstream market, and gaining market share momentum with other keyboard entries that do not include a digitizer touchscreen. Consumers are actually buying into the idea of a digital pen. Convertible tablets with a built-in keyboard are fast movers in this momentum in the mainstream. Slate tablets, which have no keyboard, are more prevalent in specialty environments such as healthcare, manufacturing, hospitality, manufacturing, government, construction, and other fieldwork. Motion Computing produces some of the best slate tablets in the world, and its latest offering, the LE1700 lives up to its legacy. 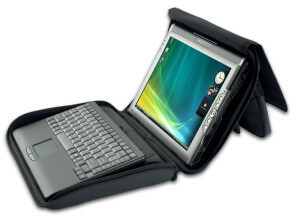 They offer an optional mobile keyboard that can be used with the Tablet PC either in the field or at the office. If you spend most of the time standing on your feet and want the lightest big screen tablet available, the LE1700 is the best option in the market today. Most slate users will rest the LE1700 on their forearms and occasionally on their laps, therefore, weight plays an important role. The 3.3-pound single 39-Wh battery unit won't tire your arms. If you need long all-day battery life, a second battery brings the weight to 4.3-pounds. The battery life is about 3 hours with one battery and more than 6 hours with the extra battery - satisfactory for most business days. When using Windows Vista automatic power-down mode you will find the battery life extends, and you still have rapid power-up each time you need it. The LE1700 includes a 12.1-inch display which can be switch-selected into a landscape or portrait mode. The 1,400-by-1,050 resolution is ideal if your worksheets, databases, and Websites that require constant scrolling. Motion Computing offers the option of adding its View Anywhere display, a special antiglare screen made for outdoor viewing. Other options, ruggedized hard-shell case, include touch functions on the display which supplement the digitizer pen. One of the best items in the package is the digitizer pen. The pen's girth produces the most comfortable writing experience in the market, with a grip that has no equal. The accuracy of the device is superb and is perfectly matched with both the hardware and Motion Dashboard Control Panel software. where earlier versions used an ultra-low-voltage (ULV) solo processor. With the LE1700, Motion Computing has bumped up the processor, in favor of performance and the result has been a hotter running box. You feel it through the magnesium alloy lower bezel. If performance is not necessary, you can shed some heat by going to the single core processor which is still offered as an option. Heat is also generated by the extra battery. Dropping it will remove a heat holding element and offer interior circulation to the system. The unit is slender and sleek. The frame is made up entirely of poly carbonate and magnesium alloy, protecting the unit when you're out in the field. The hard drive is shock-mounted with a built-in accelerometer, which parks the hard drive's heads during a sudden movement. If this is not enough, add the rugged case when in the field. In today’s post-911 security, Department of Defense Directive 8570.1, and ‘privacy-sensitive’ world for industries like healthcare and government agencies, security features are crucial for protecting valuable data. The LE1700 encrypts data using a Trusted Platform Module developed by Omnipass™ and Infineon Security Tools. A fingerprint protected power-up sequence is available. If you travel, and connectivity is a critical component, Motion Computing has an optional EV-DO Rev. A wireless cellular modem available. With this you can surf at speeds of up to 3.1 megabits per second. You can also find a SIM card slot that will enable you to use Cingular's HSDPA standard high-speed cellular connection. Both of these wireless wide area network (WWAN) services require service plans that costs $70 to $90 a month. For desk use, the LE1700 has Wi-Fi (802.11a/g) and an Ethernet port built-in as alternatives for accessing the Web. The ethernet is designed for use with the optional desk console as a wired ethernet connection would severely limit your tablet mobility in the work environment. The LE1700 comes with ComputraceComplete bios routines built-in to reduce computer theft. Once the buyer purchases the tracking plan from Absolute Software, the computer will be visible to the monitoring computer at Absolute Software. If someone steals the unit, they will be caught the next time they log onto the internet. The software identifies the thief’s ISP and user ID. They will notify law enforcement and the unit will be recovered. Service purchasers get a $1,000 recovery guarantee if they cannot get the unit back within 60 days. Like any Slate Tablet machine, LE1700 is geared toward professionals who spend the majority of their time on their feet. So if even half of your time is spent at your desk, a Tablet may not be for you. If you really like this Tablet, you should consider the station and keyboard options. Healthcare and fieldworkers are vertical markets that seem to favor slate tablets, and those who prefer a keyboardless tablet should tack on an extra half-star to my rating. Granted, a system with all the bells and whistles is extremely expensive, and tacking on the options can easily put this system above $3,000. However, if your preference runs toward slate tablets, and you're looking to keep the weight off, then the LE1700 is definitely worth your attention. If you have tried the LE 1700, tell me what you think of the product.